It would appear I’ve been MIA for a long while (other than the Taco post). Rest assured I’m still here and kicking, just been chewing through a fairly hefty renovation job on one of the bedrooms of our house, which I have now thankfully finished. Additional power sockets added by the TV – this included insuring they were on 2 different circuits. To keep the power in 2 studs only there was also some cable tidy up. Conduit mounted for speaker cable and speaker cable run. 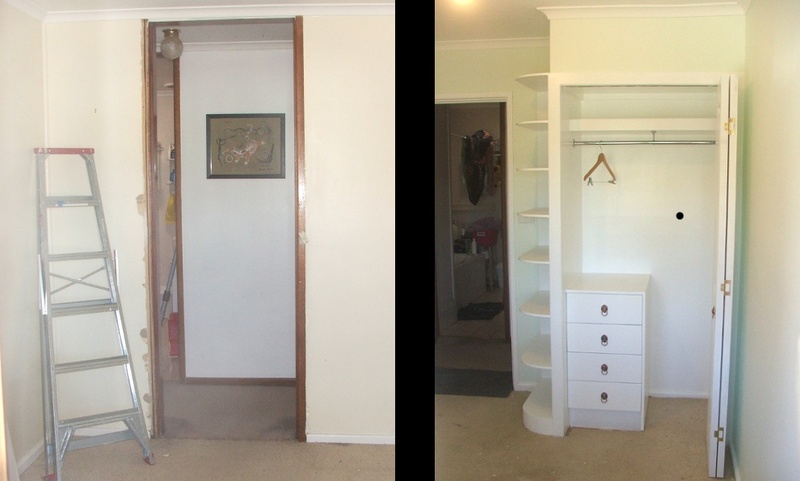 Bedroom door shifted 40cm to the left and changed from full height door to normal height door. server/network (Node Zero) cupboard constructed and power sockets added above bedroom cupboard – this is pending completion. 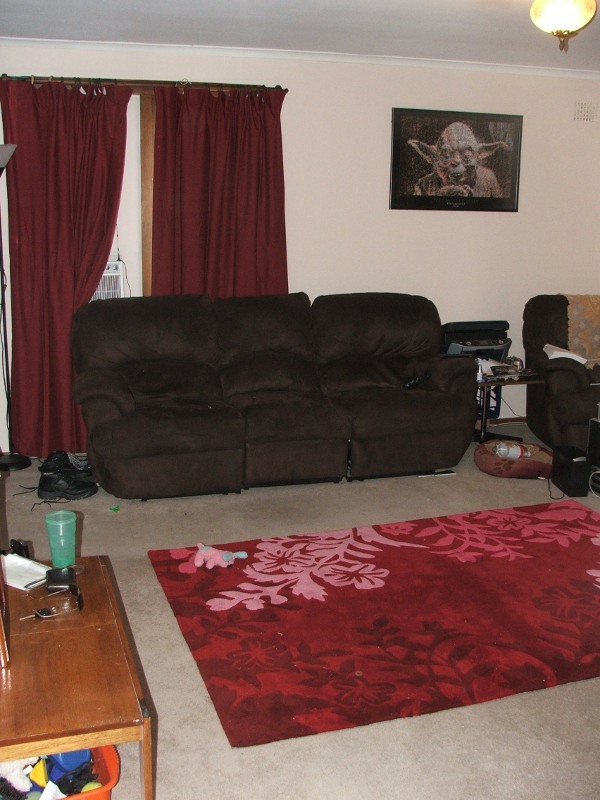 I find it fairly difficult to photograph rooms but hopefully the below gives an idea of whats been done. The draw unit in the cupboard is actual a flatpack kitchen draw set, unfortunately I had to hand cut all the draw face plates and build a box to slide the unit into. 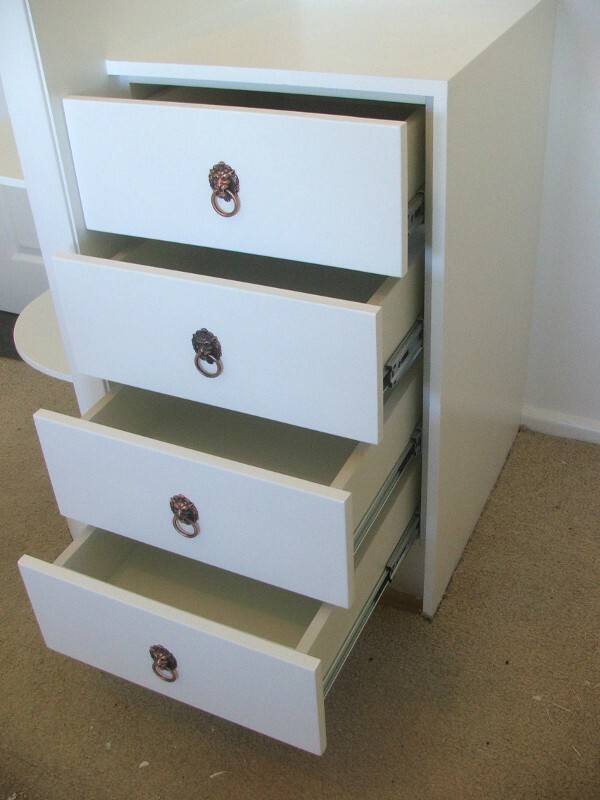 It does work very well and the kitchen draw slides are much more robust than what you normally find in wardrobes so hopefully I wont have a problem with the draws for a long time. 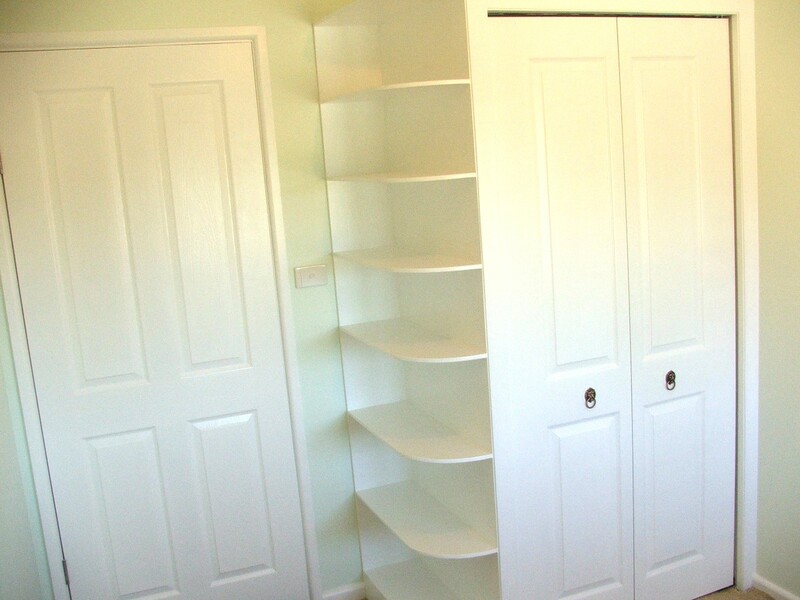 The shelving built onto the left end of the cupboard are also built-in. We left the end closest open so that when you look into the room from the doorway (or out) it doesn’t block sight lines and helps to make the room feel bigger. 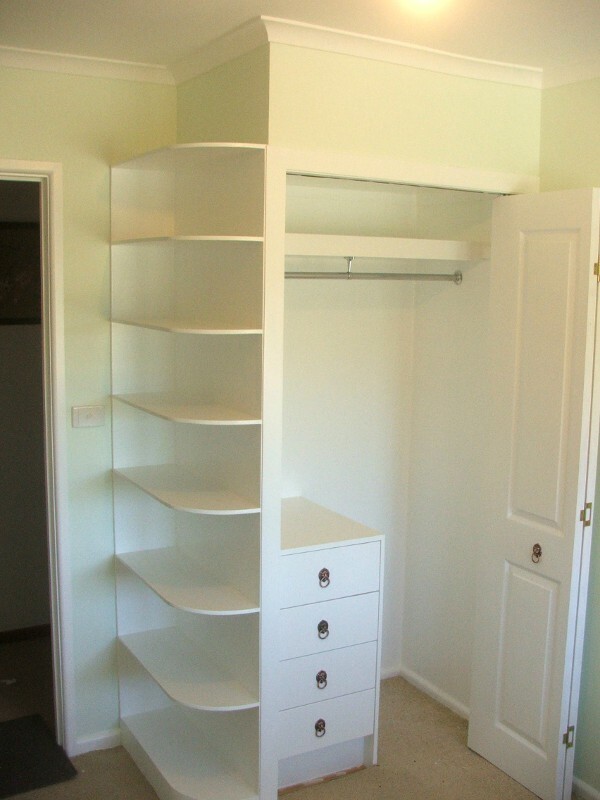 The unit itself took me about 2-3 solid days to make (curve at the bottom was a bit of a challenge) and each shelf is routed into the back and side to maximize support. Even with that we’ll only use half of each shelf for books and the free ends for ornaments/nick-naks. This seems like a really short post for something that I spent close to every spare weekend since February working on. We spent last weekend moving some stuff back into the room so there are now somethings on the shelves and pictures on the walls. I plan on taking a break from house renovations/fixing for a short time so expect to see a bit more paper/wargaming stuff in the next few posts I have a heap to catchup on :). It has been a while since my last post however I have been very busy, until now I haven’t completed any projects. I try to keep my blog for things I finish so that I do finish them. This is the first post of three showing one of the big projects I’ve/We’ve (Wife, Dad, Mum, Odd Tradesman) have been working on over the past 3 months, the other two projects being; having my house re-clad and working hard to finish off the refurbishment of the spare room. Firstly it’s light about 100kg (220lbs) assembled as a tabletop trailer, I have a small car so I wanted to minimize the dead weight I tow. Thirdly I can fold it up and more easily push it around and store it without it taking up a huge amount of space. I wont do a big blow by blow assembly post there are quiet a few nice U-tube videos showing assembly and folding. Overall the assembly was reasonably easy although it did take two of us about 6 hours to go from 3 box’s of parts to a finished trailer with working lights. I didn’t order a floor from carlex as I couldn’t see the point in shipping ply halfway across Australia. Once the trailer was assembled and the floor was on I rolled it down to my local blue slip inspection station. I wont say it was an easy process to get the trailer blue slipped but it definitely was not as tough as getting a Custom built job engineered and then blue slipped. Small tip replace the nuts that come on your light fittings with nylocks one of mine rattled a little loose on the way to the inspection station and then they wouldn’t pass it, which meant my trailer then got trapped unregistered on the other side of my wall cladding material for 4 weeks. I suspect most people wont have the issue of having there new external wall cladding blocking the rear garden gate so it was really a non-issue :). 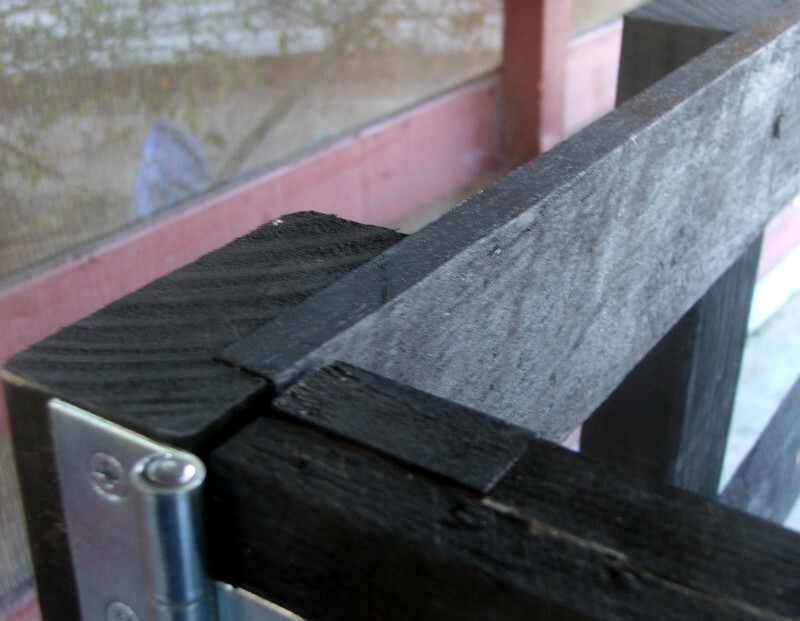 I used Aussie hardwood fence slates for the rails should be tougher and stronger, the uprights are standard structural pine. Added a double swing gate to the rear that meets in the middle for easier loading and unloading. Someone else might like to add rear gates so I’ve included a few close up pictures below of how I mounted my gate. The ocy strap is just in case, but I have been unable to rattle the drop bolts apart when driving and I’ve tried hard. My gates wont fold back 270 degrees but they do go back a little more than 180. 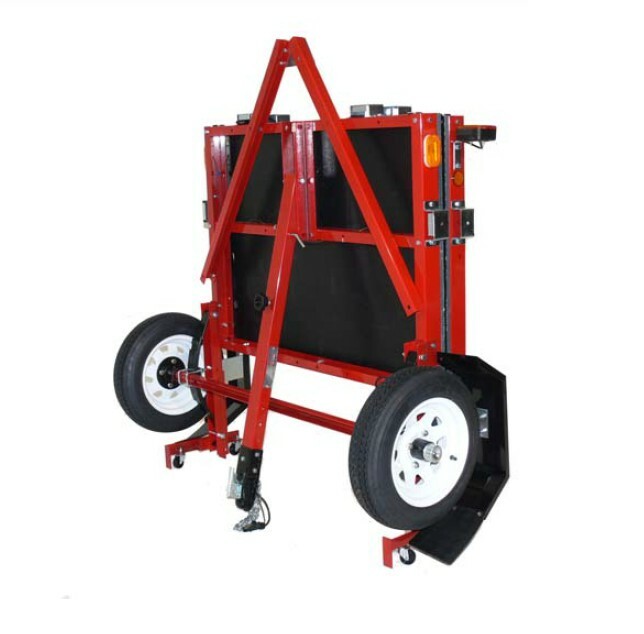 You could mount the hinges on the side and use normal square hinges for a full fold back. I decided to stick with the below configuration as the T hinges provide added support to each of the gates. 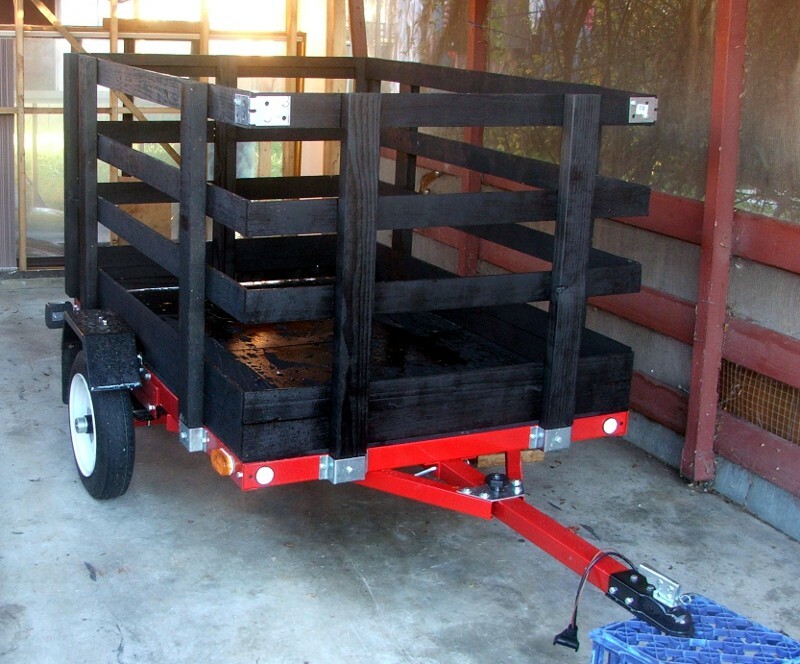 As a tabletop trailer for hauling plasterboard, doors and other large flat building supplies (done). A friend is going to use it to move his motorbike around on the odd occasion so it will also be fitted with a removable front wheel channel (to be mounted). 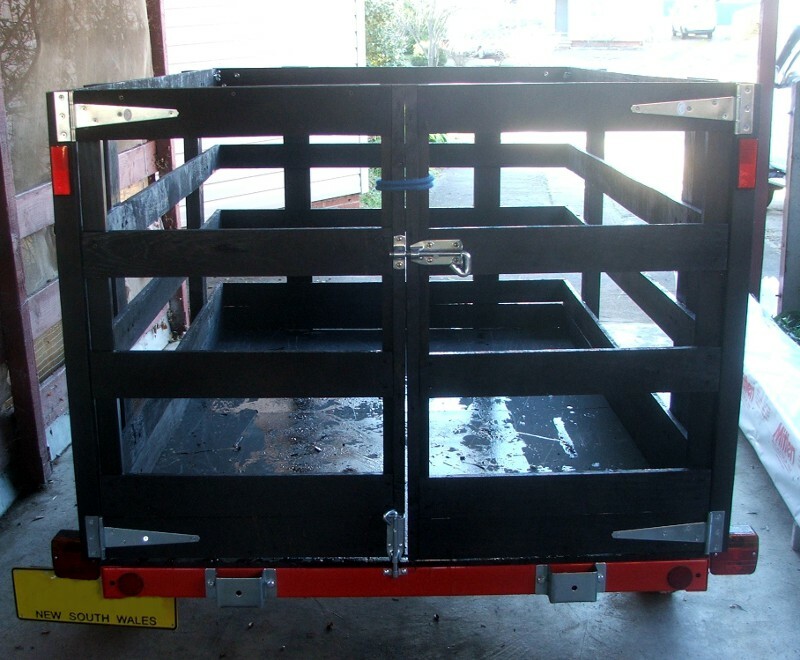 As a 6×4 cage trailer for hauling rubbish or moving odd bits of furniture quickly (done). 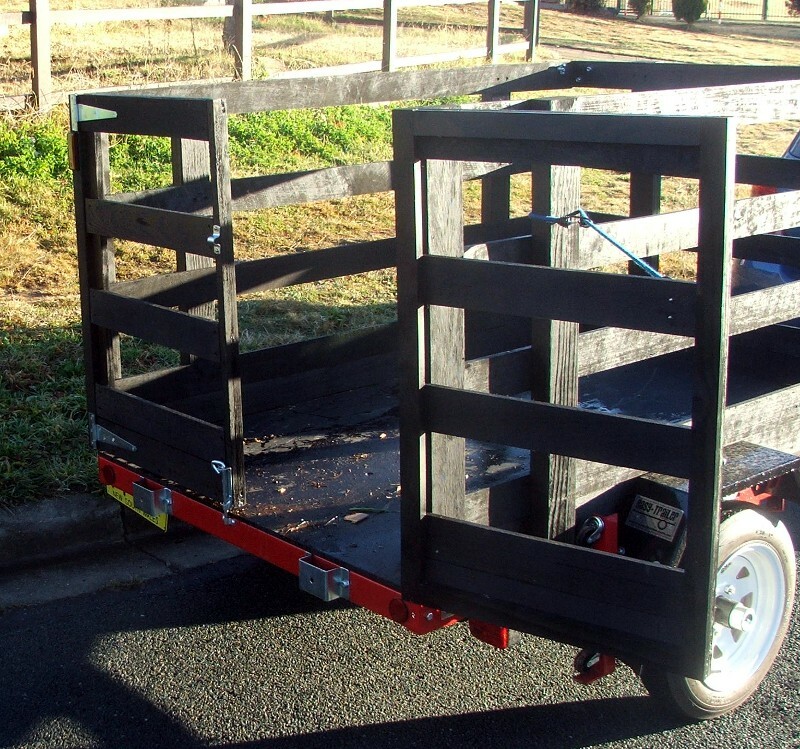 All in all I’m very happy with my folding trailer all up costs for the kit, rego and crate are about $1000, for a 6×4 trailer which weights with crate about 135-145kg. Not the cheapest 6×4 you can buy but probably one of the more versatile and easy to store. I’d recommend to anyone thinking of painting to put the dog outside we ended up with pink paw prints all across the nice chocolate brown lounge. 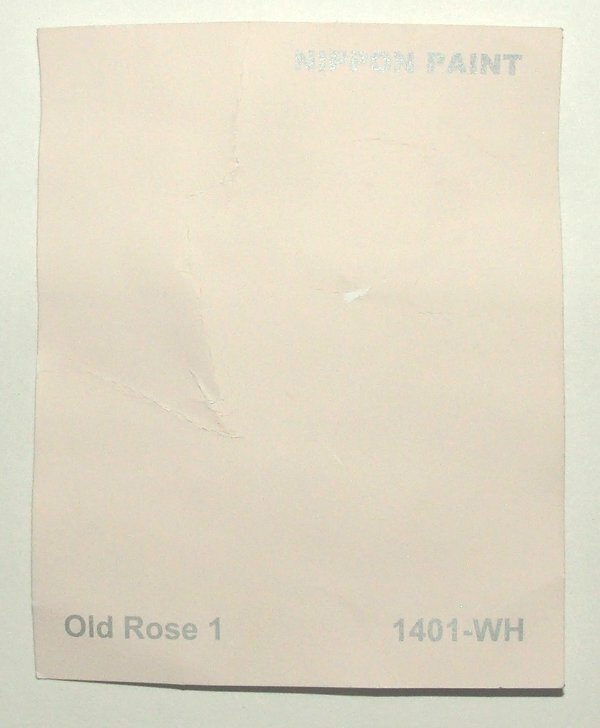 Fortunately as the paint was water based a quick wipe with a damp cloth had the paint removed, although we probably could have said it was a new trendy pattern. While we waited for the paint to dry we headed to spotlight to get some new curtains. 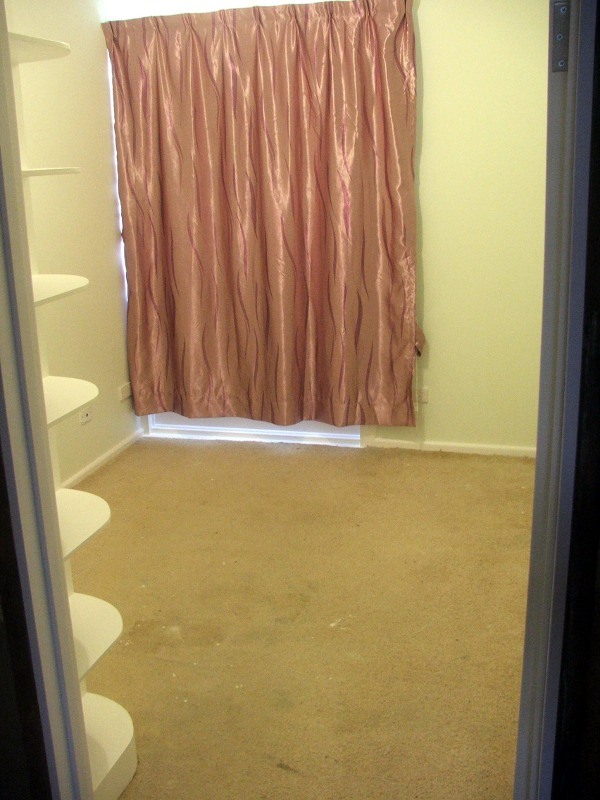 We didn’t really want a christmas theme in the lounge room of green curtains with light pink walls. We found some very nice deep red/claret curtains in spotlight that where full blockout and quiet heavy. 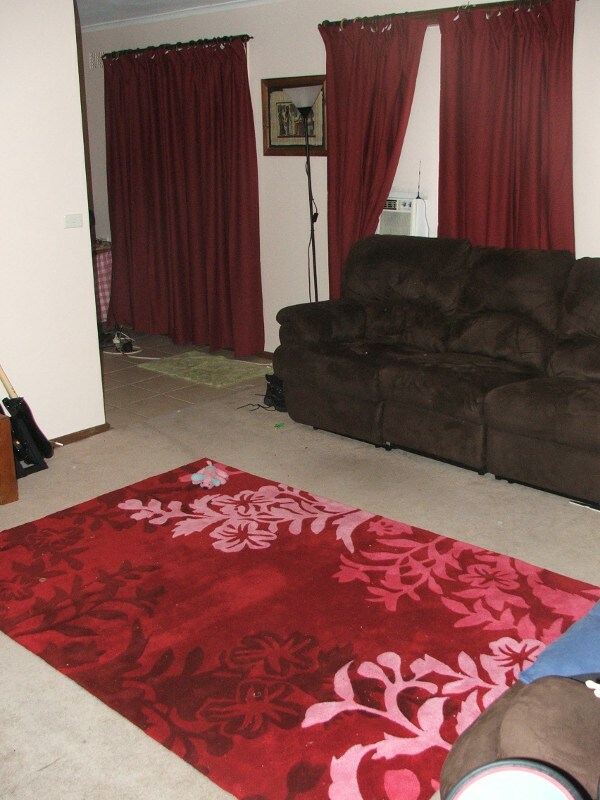 We bought three sets to replace the 3 green sets in the lounge room. 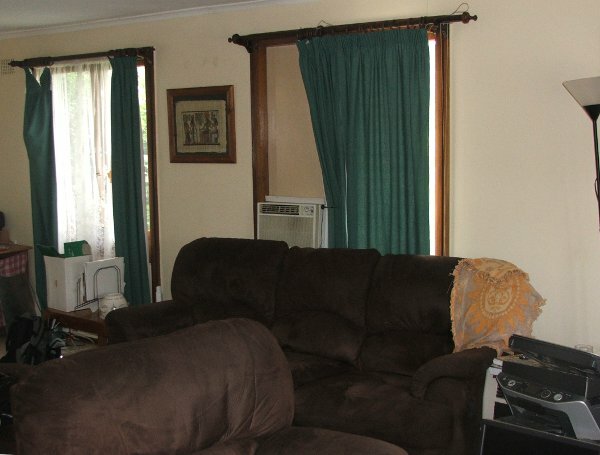 Although with the both of us knowing about as much about curtains as we do about brain surgery we did forget to buy the string you need to thread through the top that makes them pencil up, but we hung them up anyway and they look much better than green. The last little job was to hang two new lights on the side wall were the old fake gold ones had been we went with simple round lights. Although neither of us is to hot on the chrome. They were cheap and as the wall they hang on is probably going to be removed in the future when we re-do the kitchen they will do the job for now and certainly look better than the old half broken light fixtures. Although this wasn’t an expected project it’s certainly helped improve the look of the lounge room and it feels more like our house (the lounge area anyway) now rather than somewhere we just happen to be living. I’ll be moving back to one of the three main pending projects now and having a think about what I’ll add as a fourth. 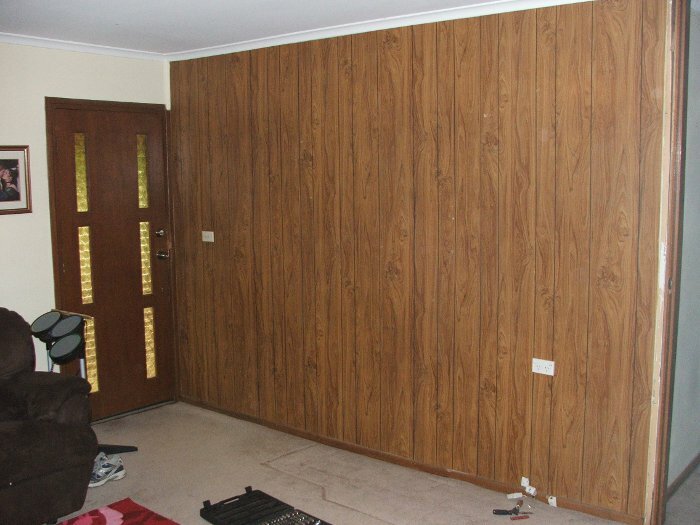 The lounge room wall in our house has always looked like it was trapped in the 1970’s . My parents dropped down for visit and to help with one of the many house repairs needed. 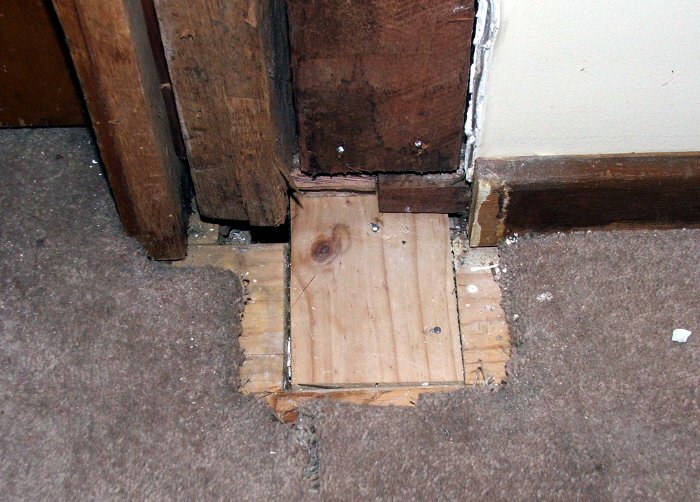 As this is one of the cheaper repairs required on the house we decided to rip into it. 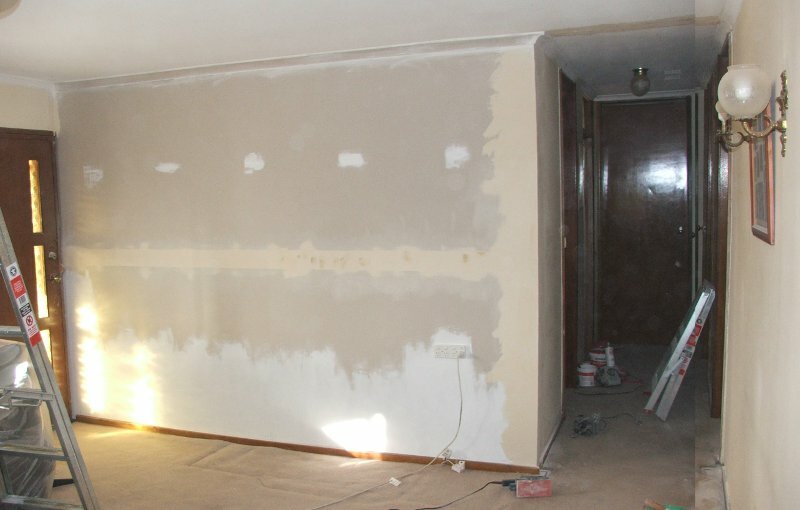 I’d investigated under the fake wood sheeting previously and the plasterboard underneath was heavily damaged and covered in (if you can believe it) a wallpaper even uglier than the fake wood. 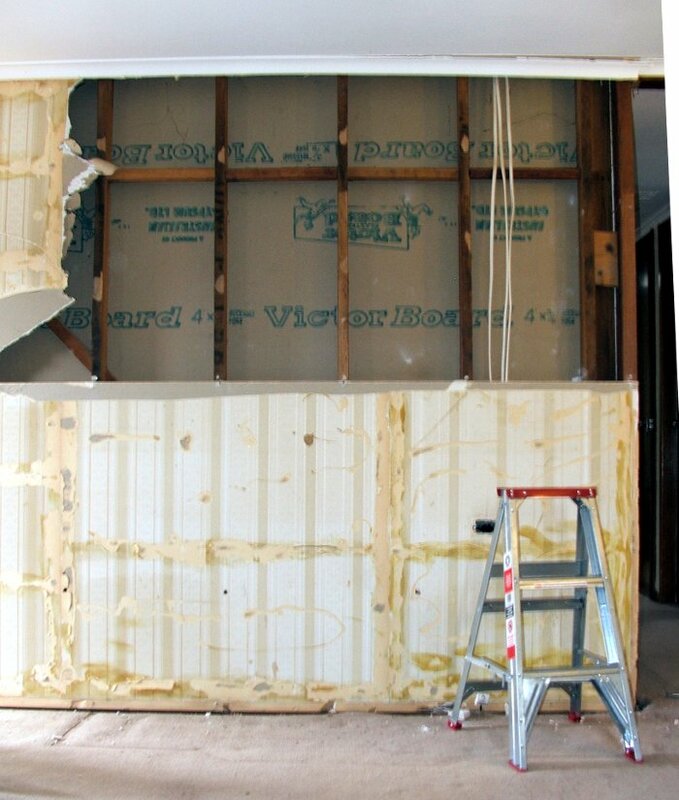 Additionally we wanted to remove a door that was present between the lounge room and the hallway as it was damaged and we rarely use it. The look of the wall didn’t change to much during day two. 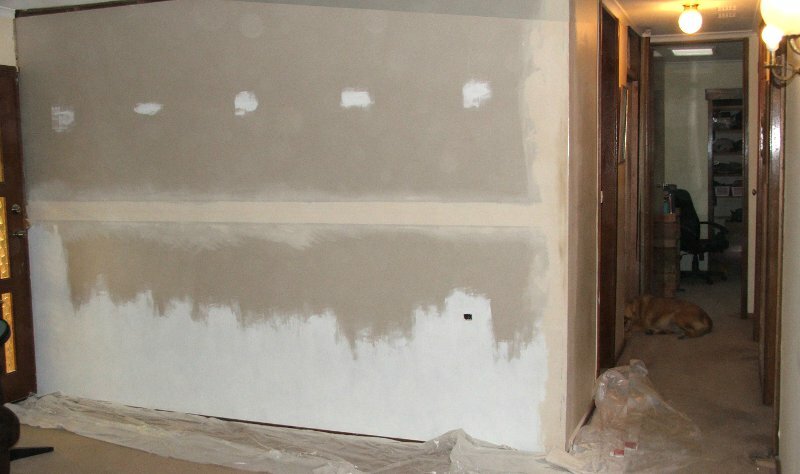 We started of in the morning by doing some sanding of the plaster we finished up last night and putting down the first finish coat of fine plaster in a few places. The big job or fiddly job for the day was trying to fill the gap in the ceiling and match the cornice up from lounge room to hall. 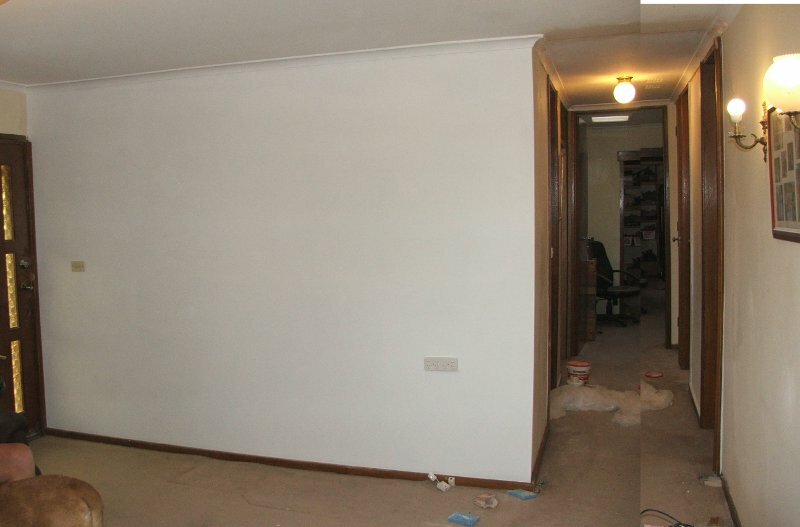 The gap in the ceiling was a problem as the hall ceiling is slightly higher than the lounge room ceiling plus we had a support beam at about the same level as the lounge room ceiling. We ended filling the gap between the support beam and the lounge ceiling with a small piece of plasterboard. Then sanded the support beam surface a little to smooth of the rough edges, finally we skimmed a layer of plaster across the whole lot. 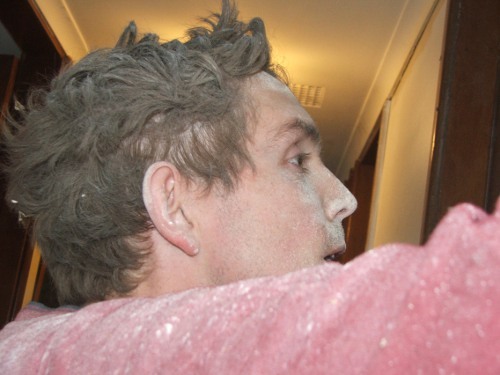 We then just made a small plaster step up from the support beam to the hall ceiling and plastered it. The end result looked okay and should look fine once all the sanding is done. The above problem of course meant the cornice also didn’t line up, so we had to try and custom fit two small pieces of cornice between the existing/new cornice in the lounge room and the old cornice in the hall. This required a lot of fiddling and use of plaster to shape and streamline the pieces together. The result looked okay although a fair amount of sanding and shaping will need to be done tomorrow.